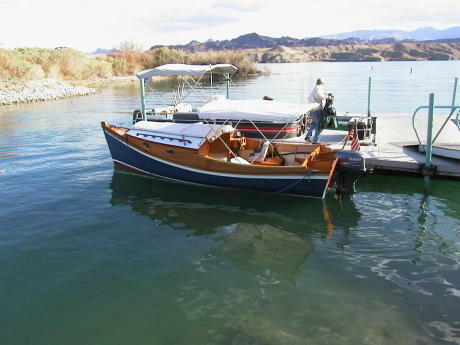 Late February Sacagawea was fitted out for a short cruise up Lake Havasu following the old Colorado River bed to Topock. 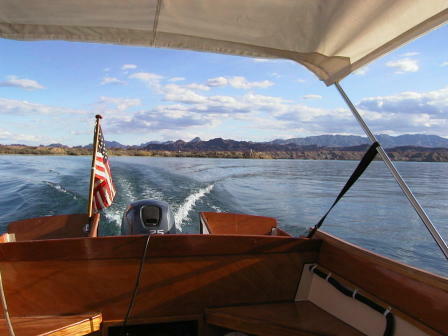 The average temperature during February is 70 degrees at Lake Havasu and the water temperature is about 55 degrees. It’s like having air conditioning in the desert. What could be better than a cruise under a clear blue sky and warm sun? Launching at Six Mile Island (Lake Havasu City) Public boat ramp was free and a good starting point. Lake Havasu City is the central point of the lake. In 1957, Robert P. McCullooch was looking for a fresh water-testing site for his outboard motors engines. He was granted land with a provision for improvement and the growth soon caused him to move his testing to Los Angeles. The is not what it is like in the summer when all the throngs of skiers and boats make it very crowded on the lake and the boat ramp. Late in the afternoon Sacagawea was loaded and cast off for London Bridge. Can you believe someone bought the original London Bridge and rebuilt it as the bridge to Six Mile Island? It has attracted a lot of tourist.